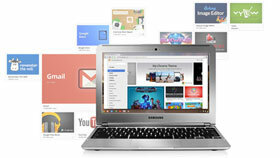 Enter the Samsung Chromebook. It's really well priced, and for someone who really does NOT want the complexity of a traditional OS, and who will always have WiFi, it's just the ticket. We think! I'm thinking about getting a Chromebook for my XYL Olga. So I'd be interested in any updates on how you get on with it.